ReQuest on Thursday announced the release of NetSync for Mac OS X. The new Mac version complements a release already produced for Windows. The software is designed to work with ReQuest home media servers using Serious Play software 4.6.2 or later. NetSync lets you synchronize your Macs' iTunes libraries with a ReQuest audio server on your network. NetSync enables multiple iTunes libraries to be synchronized into one master collection stored on a ReQuest server. You can sync songs, playlists and music metadata between the Mac iTunes library and the ReQuest music server. You can create new playlists and manage music using your Mac, then sync those changes on the ReQuest server. Those playlists and media can then be added to local iTunes libraries and synchronized with iPods and iPhones. 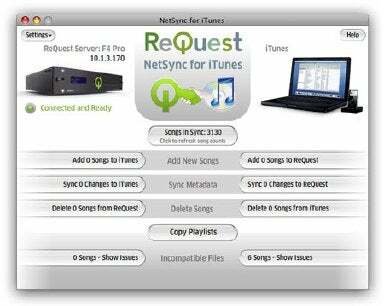 NetSync for iTunes requires Mac OS X 10.5 and is available for download from the ReQuest Web site. It’s also bundled free with all ReQuest servers. The ReQuest server line comprises mid-level audio and video products aimed at home integrators, custom home entertainment system installers and audio/videophiles looking for a server-based music or video management system. The line includes products that enable you to store all of your music or digital media in one location. They include single-zone and multi-zone “family” music servers, whole house audio systems, backup systems, video controllers and custom touchscreen interfaces.